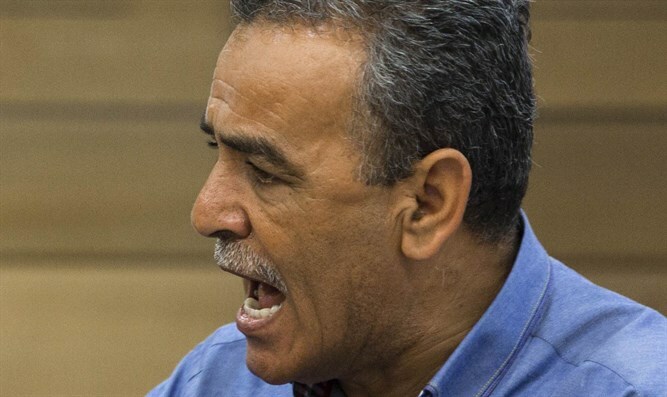 Knesset Member Jamal Zahalka (Joint Arab List) called MK Avi Dichter a "murderer" during a debate in the Knesset plenum. In a discussion on the law to withhold terrorist salaries, Zahalka went up to the Knesset rostrum and began an aggressive tirade against Dichter. "The initiator of the law is Avi Dichter, the former head of the GSS, responsible for the murder of thousands of people. The initiators of the law are shameless, supporting the murder of Palestinian children. You murdered Palestinian children, so which of you opposed? "Zahalka proposed. He added, "You are murderers, you are terrorists, you are thieves, you are the oppressors of the dispossessed and you are the hypocrites; you murdered 527 children in 2014 in Protective Edge." MK Robert Ilatov of Yisrael Beiteinu spoke about the importance of giving the law with teeth: "We must make sure that this is a law to withhold terrorists' money from the Palestinian Authority and not a law to freeze funds for the Palestinian Authority. I tried to persuade Knesset members to withdraw the freeze clause and to return to the original law that withholds all the funds, but unfortunately to no avail. "I intend to support the current law, but if the law doesn't achieve its goal, I'll return and advance the original legislation to withhold the funds," said Ilatov.